Muammar Gaddafi is dead. 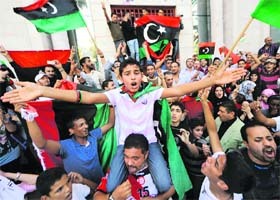 Libya's new leaders said he had been killed by fighters who overran his hometown and final bastion Sirte on Thursday. His bloodied body was stripped and displayed around the world from cellphone video. The dictator who once called the rebels who rose against his 42 years of one-man rule “rats” was captured cowering in a drainage pipe full of rubbish and filth. “He called us rats, but look where we found him," said Ahmed Al Sahati, a 27-year-old government fighter, standing next to two stinking drainage pipes under a six-lane highway. Government fighters, video evidence and the scenes of sheer carnage nearby told the story of the dictator's final hours. Shortly before dawn prayers on Thursday, Gaddafi surrounded by a few dozen loyal bodyguards and accompanied by the head of his now non-existent army, Abu Bakr Younis Jabr, broke out of the two-month siege of Sirte and made a break for the West. But they did not get far. NATO said its aircraft struck military vehicles belonging to pro-Gaddafi forces near Sirte at about 8.30 am (0630 GMT) on Thursday, but the alliance said it was unsure whether the strikes had killed Gaddafi. Fifteen pick-up trucks mounted with heavy machine guns lay burned out, smashed and smoldering next to an electricity sub-station some 20 metre from the main road, about two miles west of Sirte. They had clearly been hit by a force far beyond anything the motley army the former rebels have assembled during eight months of revolt to overthrow the once feared leader. But there was no bomb crater, indicating the strike may have been carried out by a helicopter gunship, or had been strafed by a fighter jet. Inside the trucks, still in their seats, sat the charred skeletal remains of drivers and passengers killed instantly by the strike. Other bodies lay mutilated and contorted strewn in the grass. Some 50 bodies in all. Gaddafi and a handful of his men escaped death and appeared to have ran through a stand of trees toward the main road and hid in the two drainage pipes. But a group of government fighters were on their tail. "At first we fired at them with anti-aircraft guns, but it was no use," said Salem Bakeer, while being feted by his comrades near the road. "Then we went in on foot. One of Gaddafi's men came out waving his rifle in the air and shouting surrender, but as soon as he saw my face he started shooting at me," he said. "Then I think Gaddafi must have told them to stop. ‘My master is here, my master is here’, he said, ‘Muammar Gaddafi is here and he is wounded’,” said Bakeer. “We went in and brought Gaddafi out. He was saying 'What's wrong? What's wrong? What's going on?' Then we took him and put him in the car," Bakeer said. At the time of capture, Gaddafi was already wounded with gunshots to his leg and to his back, Bakeer said. Other government fighters who said they took part in Gaddafi's capture separately confirmed Bakeer's version of events, though one said the man who ruled Libya for 42 years was shot and wounded at the last minute by one of his own men. Four more bodies lay at the other end of the pipes; all black men. One had his brains blown out, another man had been decapitated, his deadlocked head lying beside his torso. Joyous government fighters fired their weapons in the air, shouted "Allahu Akbar" and posed for pictures. Others wrote graffiti on the concrete parapets of the highway. "Gaddafi was captured here," said one simply. National Transitional Council top official Abdel Majid Mlegta said that Gaddafi’s son Mo'tassim had been killed resisting his captors. Another of his sons and heir-apparent Saif al-Islam is at large but had been surrounded after also trying to flee Sirte, he added.